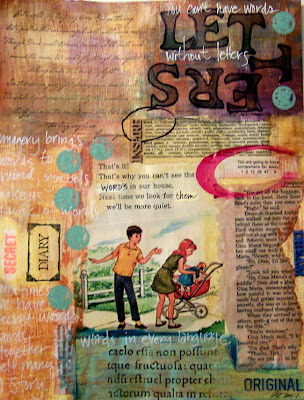 adirondack daubers, an assortment of stamps, sharpies, and torn text. Stroll on by my other blogspot: "The Artful Eye"
Wow what for a amazing compesition. Absolutely stunning. Perfect. Gorgeous composition with great colour & texture. AAAAHHHHHHHHHHHHHHHHHHHHHHHHHH!!!! This is my most favorite project ever!!!!! Sweet Mary- it's spectacular!! oooh, this is a gorgeous journal page! Fantastic compilation of words and images from a myriad of sources....I love to use many images in my mixed media collages and I so admire your doing so without creating a sense of disharmony or crowding. Your banner is fabulous...and the Who Am I.....the same things make my heart beat faster...except since I live in Arizona, when I am not on vacation, I am finding old bottles and rusty bike chains and other things in the desert. I will check out your other blog too. i wish i could journal that way!! great!